Call of duty Infinite Warfare arrives today and if you're thinking about picking it up then we've got two great Xbox and PS4 bundles to check out. You can pick between a 500GB Xbox One S with Fifa 17 and Call of Duty Infinite for £237.49, or a 500GB PS4 Slim with Call of Duty Infinite Warfare and The Division for £239.99. Either way you're getting COD and a saving. We've also got a portable 1TB hard drive to banish your storage woes, and a 55" 4K TV coming in at just under a grand. 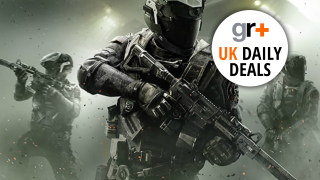 Take a look at the best UK game deals below – and tune back tomorrow for more PS4, Xbox One and hardware bargains. If you're wondering what a Quantum Dot Display does then all you need to know it that it delivers excellent colour and contrast for the best HDR viewing experience. And, all in an ultra slim bezeless design. If you need a little extra hard drive space for your games, music or videos then this 1TB portable number could be just the answer you're looking for. Especially with its USB 3.0 connection for the fastest transfer rates.